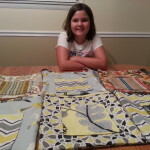 Today I worked on some new designs to bring to The Arbors tomorrow. 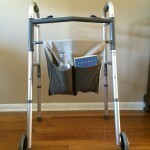 Today I made 6 walker bags which turned out great. Around 11:30am I am going to the Arbors to finally get to drop off the walker,wheelchair and the anywhere bag plus the neck pillows. Below I am adding some pictures of my final product. A new Buddee Bag in action! 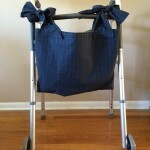 On Friday I am finally going to drop of the walker and wheelchair bags along with some neck pillows. So tomorrow I am going to work on some more I need to finish. Thankfully I have my Brother Sam (an excellent sewer and stuffer) to help me!! My Grammy and my Tia are going to go with me to the Arbors to have lunch with the residents receiving the Buddee Bags. 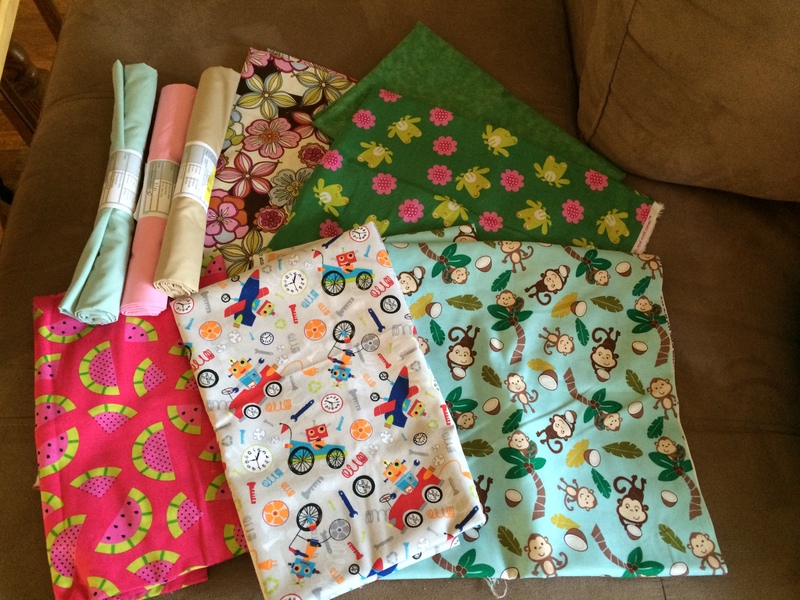 I extremely appreciate all the donations I have been getting, they will help me finish some Buddee Bags so I can take them to the Arbors where my Buddee lived for a period of time. I have so many I need to finish even my family wants to help. 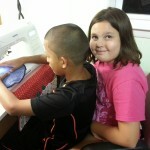 This is a picture of me teaching my brother how to sew. 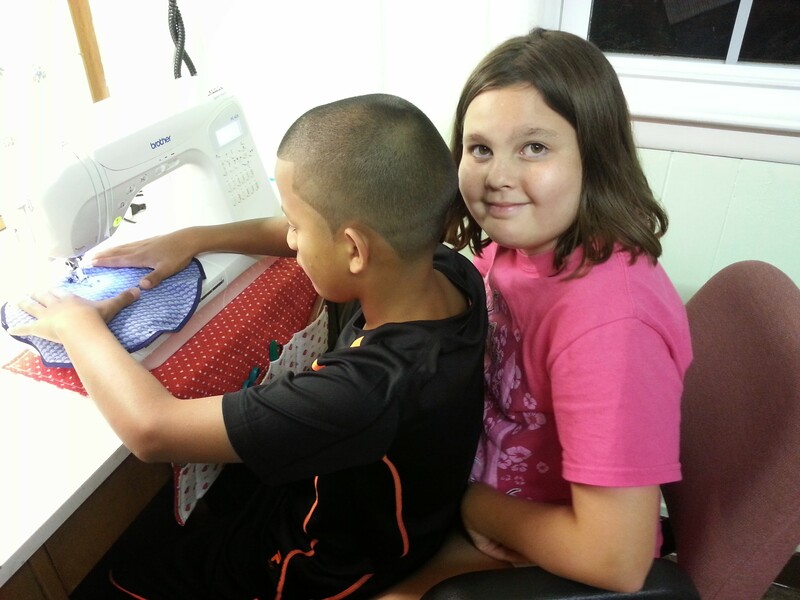 This is a picture of me and my brother sewing. 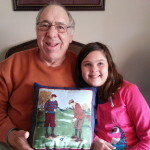 This is a picture of me giving my Pop Pop a golf pillow I made. It was very special because he loves to golf. 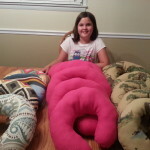 This is the first pillow I made. My Grandma taught me how to make it. 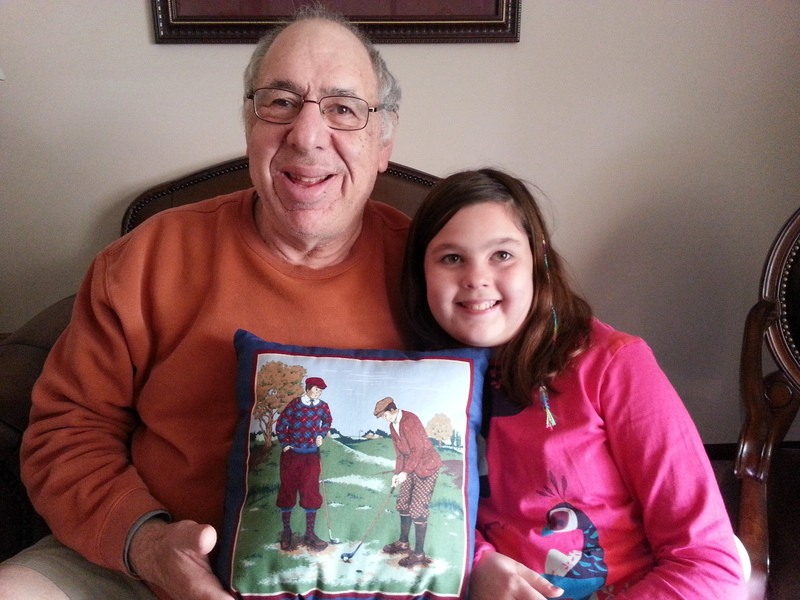 This is the first pillow I ever made. 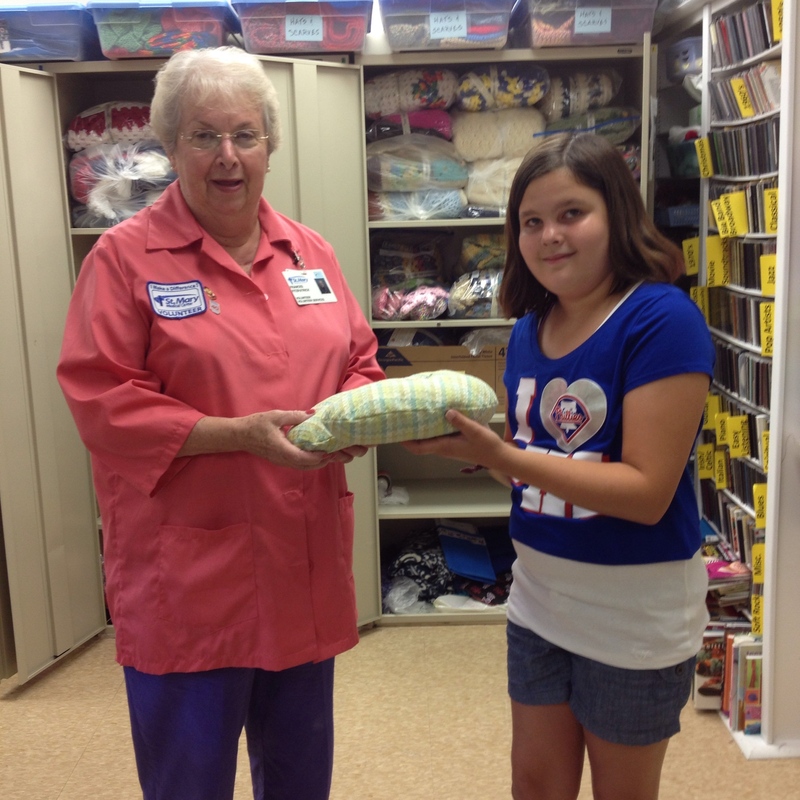 Yesterday I delivered 23 neck pillows to St.Mary’s Hospital. I sewed them with my grandmother. They were very thankful because they give them out as fast as they get them. The volunteer at St. Mary’s told me they are very popular and everyone wants one. Yesterday was a very exciting day!! 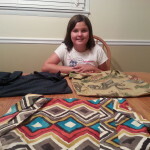 My sewing machine was delivered and I was able to use it for the first time. 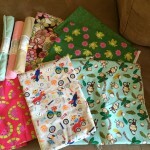 Thanks to generous donations from Mike and Amy and Ms. Shuhler I was able to buy some great fabrics in children’s prints. 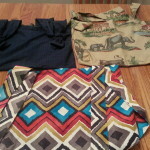 I am including a picture of the fabric. Here is a picture of me with my Buddee. 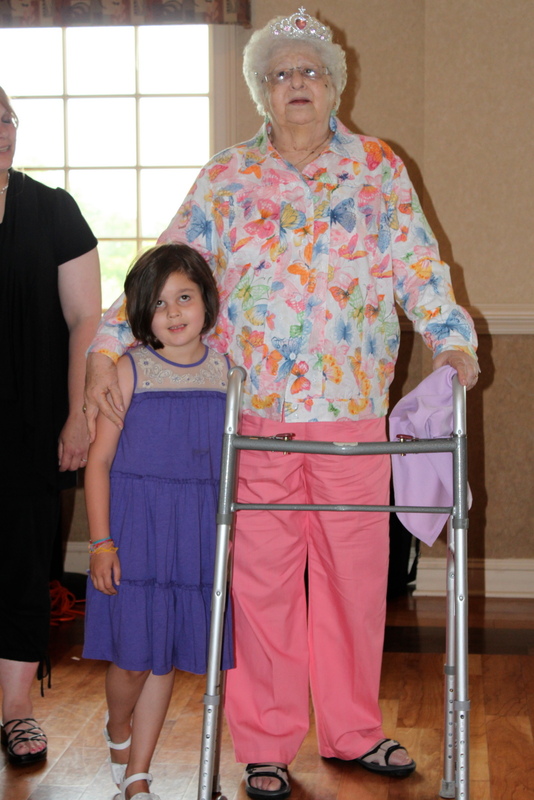 It was taken 4 years ago at her 85th birthday party. 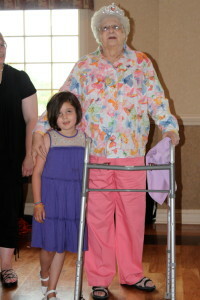 You can see she has her walker with her and she has her beautiful butterfly sweater on!! Buddee and I had a great time at the party. She was very important to me. Me and my Buddee at her 85th birthday. 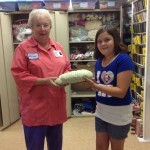 More donations and a new sewing machine! 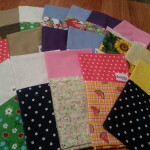 Today my Grammy told me that she will buy me my own sewing machine so I can make more Buddee Bags. 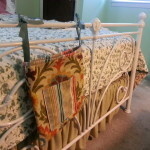 Right now I use my Grandma’s sewing machine. Thank you Grammy!!! Another thanks to my Tia who donated money to me for more supplies. Thank you to Tia!!! 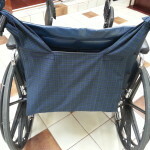 The first samples of the walker bag and wheelchair bags are done. I think they turned out great! I have a few completely done and about 10 that are half way done. 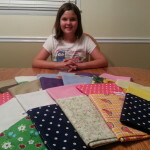 I want to include some patterns for younger kids too, so I will be looking for juvenile fabric. 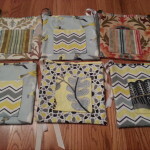 I am looking forward to bringing the first finished bags to a local Assisted Living residence. 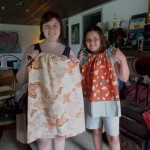 Last week I had a chance to drop off the pillowcase dresses and shorts I made for Dresses With LovE. 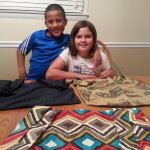 They are going to Arizona to be used for children on an Indian Reservation. 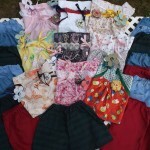 I sewed 9 dresses and 15 shorts. 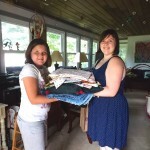 I was really happy to get to meet Emma and see all of the dresses she has made and collected. You can learn more about Dresses with LovE by clicking here.